They only have been dating for a year. But David Harbour and Alison Sudol are already in sync. 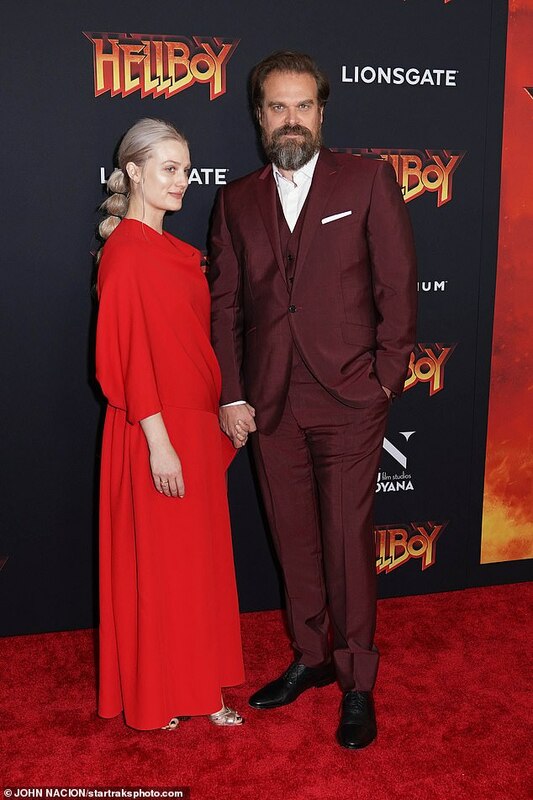 The 43-year-old actor and his 34-year-old girlfriend both wore red as they attended the special screening of Hellboy in New York City on Tuesday night. The happy couple weren’t shy about showing off their love as they walked hand-in-hand on the red carpet. David looked handsome in a three piece burgundy suit over a crisp white dress shirt with the top few buttons undone. His hair was worn in a combover as he sported a burly grizzled beard. Alison looked gorgeous in a flowy bright red maxi dress. Her silver locks were worn down and tucked behind her ear as she wore natural, complementary make-up on her face. David also hammed it up with his co-stars on the red carpet including Milla Jovovich.